PayrollPanda — How do I pay my invoice? Help Center Home App How do I pay my invoice? Invoices are generated after a payroll is run and will be emailed to you. You can also find them under Settings > Subscription. Here you can download the invoice by clicking the invoice number and proceed to pay. We request that invoices are paid at the same time as your statutory payments, i.e. before the 15th of each month. Available payment methods are currently either online via FPX, manual bank transfer or cheque. Log-in to the PayrollPanda app and go to Settings > Subscription > Pay Online. A new page will open where you can select your preferred bank and proceed with the payment via your online banking portal. Once paid you will receive an invoice receipt and the payment status will be updated in the app. IMPORTANT: Always include the invoice number in the transaction description or send the payment reference to admin@payrollpanda.my. Please ensure the invoice number is quoted as the payment reference when making bank transfers or cheque payments (at the back of the cheque). 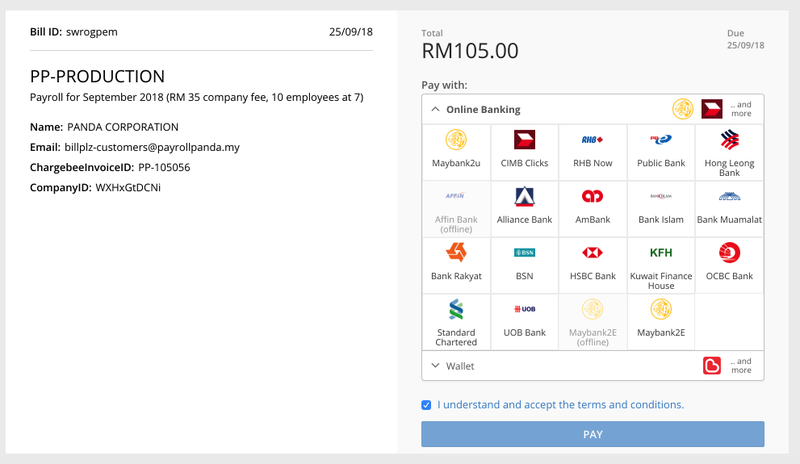 IMPORTANT NOTE: If you do not make payment of the invoice before you run your next payroll, you will be disabled from running it with a popup notice. You should therefore pay on time to avoid delaying your upcoming payroll.